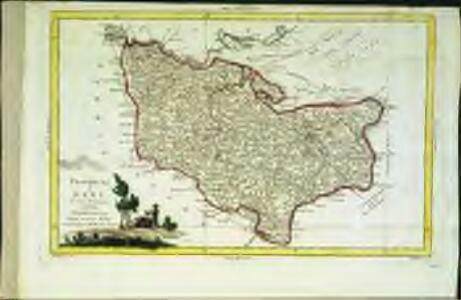 This is a map of the Romney Marsh area, dating from around 1590. It shows the network of sewers and waterways in the area and is principally concerned with drainage. The locations of bridges are carefully recorded. The topography of the landscape is depicted with hills, trees, churches, towns, villages and windmills shown pictorially. A small island in the sea records the location where a village once stood. Camber castle is shown and the draughtsman has attempted to indicate the actual architectural features of the castle. This is a map of Rye Harbour and the Isle of Oxney, dating from around 1600. Positioned on the estuary of the River Rother, Rye affords a clear view of the Romney Marches, making it a valuable post for coastal defence. Places are represented by elevation views of buildings. The concern with coastal defence at this date was due to England’s continuing war with Spain. Although the Spanish Armada was defeated in 1588 Philip II attempted further invasions during the 1590’s. A scale bar showing ‘myles and furlonges’ is included. The practical use of this map is hinted at by the differentiation in the presentation of domestic townscape views, shown in pictorial elevation, and the plan form that represents Camber Castle, a defensive military structure. A scale bar showing ‘myles and furlonges’ is included.